Clean, cheerful and pet friendly! What more could you ask for?! Come and enjoy this comfortable 2 bedroom 2 bath home located right across the street from the beach! Easy access to public beach access located at 16th St. Both bedrooms have a queen size bed. A futon is in the living room perfect for visiting guests or children. 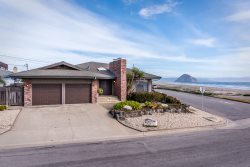 Walking distance to downtown Cayucos, pier, restaurants, Tavern and more! Gas fire place, WiFi and new smart TV with DVD player. Vacation Ready!